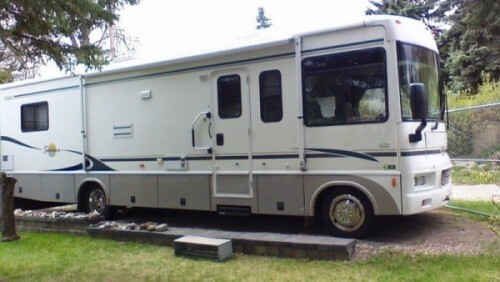 2009 Great West Vans Titan 24ft Class-C Motorhomes. Used very little. 4spd auto, AC. Awning. 4 hrs on generator. Original owner. Everything needed to make it a great home on the road. Please call 306-873-3122. 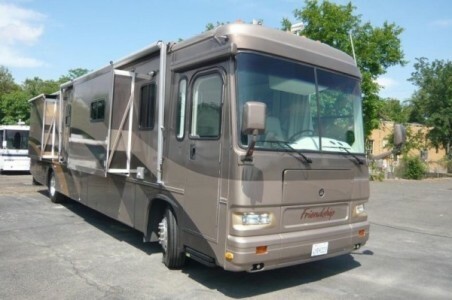 2003 Gulfstream Friendship 41ft Class-A Motorhome. For sale a Class A 2003 Gulfstream Moterhome in mint condition. It has a Caterpillar Diesel 400 HP Engine. 4 Pushouts, Twin Air Conditioners. All New Tires. New Batteries (Deep Cycle). Back up Camera, Air Brakes. Inside you will find Premiun Leather Seats, Chairs and Couch. Freestanding Table and 4 Chairs. Washer Dryers Combo Set,Large Fridge with Icemaker, Freezer. Walk in Shower and Sink, Queen Sized Bed,Two TVs. And Alot More, Please Call or Text Albert in Watrous Sask @ 306-946-2660. 2010 Forest River Georgetown 378 Class-A Motorhome. Looking to head out and get away from it all. This unit has all your requirements. For getting you to your destination, this unit has a Triton V10 gas engine that while economic provides power when needed. Dual battery system, Heated Mirrors, Backup and side camera system, loads of “basement” storage with pass-thru space for all your toys. Like to get far away, and find no power or facilities, no problem. This unit is equipped with a 5500 watt generator for all your quiet power needs. It also has large holding tanks for fresh water and all that other stuff so you can stay for a few days and relax. The triple slide layout gives you maximum, great space for all your get away needs. An Arctic Pak on all holding tanks, double pane windows, 2 force air furnaces and a ducted air conditioner with built-in heat strip will ensure you stay warm on those lovely get-a-ways. This unit also has cable TV/phone/satellite hook-ups built in. In the kitchen/Dining room area you have a full size microwave/convection oven, large 3 burner stove with full size RV oven, double sinks in kitchen, Corian counter tops with sink and stove covers, double door fridge and freezer with built-in ice maker and cold water dispenser. The dining room table comes with 2 fold-out extensions and 4 chairs. The living room area has an electric fireplace under the 32 inch flat screen TV, so you can curl up on the foldout sofa or stretch out in the lounge chair with ottoman and watch a great movie. If you need more space for company, spin the travel seats around for more seating. Retiring for the night, grab a relaxing shower in the full size shower with its own sky light. The washroom sink is a coloured glass bowl that sits on a beautifully finished cabinet. The toilet is home style porcelain and is separate from the rest of the washroom area, allowing for those private times. In the bedroom you have a full size RV Queen size bed with a custom mattress and under-bed storage. There is his and hers Wardrobe closets and plenty of overhead storage as well. Once you are tucked in, catch the late news on the flat screen TV. On laundry day, no need to wait in-line at the Laundromat, just throw a load into the built-in washer/dryer and relax. 2012 Winnebago 42QD Tour Class-A Motorhome. MUST SEE!! 450 Cummins Diesel; 10 KW Onan Generator; 3 slides; aqua hot provides instant heat, Beautiful cherry cabinets; quartz countertops; 2 bathrooms; king sized bed; queen sized pull out; washer/dryer, Used for one winter in Palm Springs. Please call 306-861-1062. 2004 Newmar Northern Star 40ft Class-A Motorhome. Only 30k on MH and stored in a heated shop and in showroom condition,new top grade Michelin tires,upgraded cupboards and absolutely every option available. Paid $354000 in 2005, Can be sold with 2004 Envoy SUV tow vehicle,full load and excellent condition $9000 with hitches and brakes.Reason for selling bought a place in Palm Springs come make us an offer!! Please call 403-350-8299. 2008 Pilgrim Open Road 358RL Fifth Wheel 4S-5 Open Road 5th Wheel. Rear Livingroom, Fireplace, Desk, Large Double Door Fridge Corian Counter Tops, King Bed, 2 Flat Screen TVs, Surround Sound, Microwave, 2 Rocker Recliners, Leather Hide-a-Bed, Air-Conditioner. Power Awning, Built in Vac, Universal Docking Station, 10 Gallon Water Heater, 65 Gallon Fresh Water Tank. 50 Amp Service. Plus Much More. Excellent Condition. Call Ken 403-382-8189. 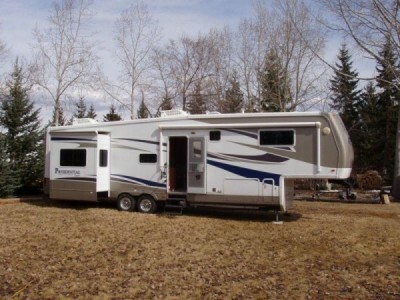 2007 Crossroads Paradise Pointe PF36RD Fifth Wheel. 4 slides, each with awnings. 3 Fantastic rain sensitive, thermostatic controlled roof vents. Remote control heat/AC. Day/night window shades. Central vac. Gas/electric hot water tank. Ceiling fan. Desk. Queen bed. Sofa bed. 2 recliners. Flat screen TV. Surround sound,AM/FM system, DVD&VHS player. 4x8x5' Vinyl fabric enclosed storage under front of trailer. 20' awning. Shade/bug screen with 3 sides around extended awning. Very clean, stored inside when not in use. Please call 780-672-6212. 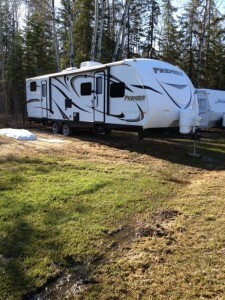 2012 Forest River Shockwave 28ft Toy Hauler. Well maintained 1/2 ton towable, Sleeps 8, Two power bunks in the rear, two rocking swivel chairs, Power awning, Built in 5000 watts generator, two 6 volt batteries, power front jack, 40 gallon fuel station, 110 gallon water tank, 50 gallon grey water tank, 50 gallon black water tank, Built in power washer, Lots of storage, Flat screen TV/DVD/Blue Ray player, Out side speakers, Great stereo system, Dimmable outside lighting, Rear ramp lighting, fuel station lighting, Stove top and convection microwave, roomie shower and many other extras. Extended warranty till 2019. Dry weight 7600 lbs, GVWR 11550 lbs, Overall length 32 feet. can carry 2 ATV's or one sideXside. Will post more pictures soon. Trailer is currently being serviced for 2014 season. I had greaseable bushings installed and a wheel alignment done. We paid $44000.00 for this trailer, we bought it new. Please call 780-878-1307 for more details. 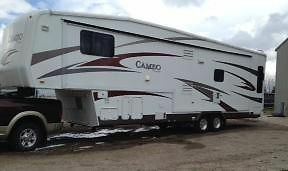 2007 Jayco Designer 34RLQS Fifth Wheel. Beautiful unit with 4 slides all with retractable awnings. Rear living room with fireplace, 32"LED TV, surround speakers and desk area. Bedroom has queen bed & TV, full size closet and bureau. Island kitchen w/huge pantry, corian countertops, convection/ microwave halftime oven, dining table w/4 chairs. 2 Fantastic fans - in living room & bedroom. Ceiling fan in kitchen. Bathroom has large sink, handheld shower head and tall toilet. Front entry coat closet with mirror. Sunshades for all windows, front stabilizer tripod, new tires. Excellent condition. Please call 780-963-7995. 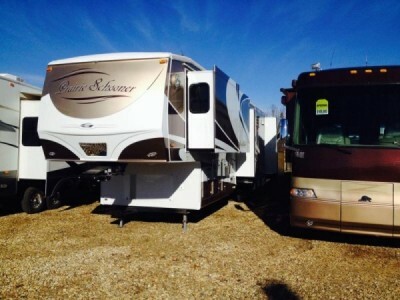 1999 Newmar American Star 33ft Fifth Wheel. It comes with everything you need all you need to bring are your clothes n bedding. This trailer is situated on a lot in Centennial Park. It is all set up for 4 season living. In Dec 2013 we installed a new furnace. There is an enclosure built over the sewer n water system to keep it protected from the elements and is fully insulated. There is also a fully insulated mud room at the entrance of the trailer. All the windows have been tinted to keep the sun out. There is also a 10' x 12' shed on the lot. It has been shingled but not sided, fully insulated with Roxul safe n sound. There is also an oak table with four chairs they are done in the burgandy colour.The freezer comes with it as well. Asking $35,000. Thanks for looking. Please call 780-792-1482. 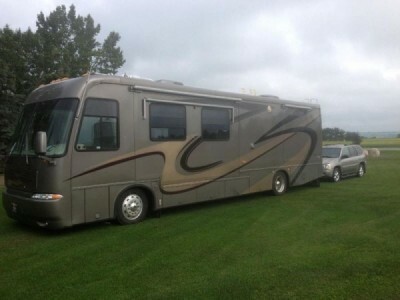 2003 Winnebago Itasca 33ft Class-A Motorhome. workhorse chassis, 8.1 L Vortex V8, 4 speed OD Auto. Trans. Mileage 64,368, 1 slide, hydraulic. Leveling jacks, 5500 watt Onan power planet. New Awning, Fuel capacity 75 gals, Water 75 gals. Rear Queen Bed. Lg shower Rearview monitor system. Excellent condition. Please call 403-274-3378. 2007 Dutchman Grande Junction 34TRG Fifth Wheel. Grande Junction TRG, loaded with all toys including Gen Set. Custom steps included along with Sat TV dish(s), holding tank pump, and ready to go. Sleeps 4. Great for a home away from home for work at job site. Many extras. Please call 780-618-7515. 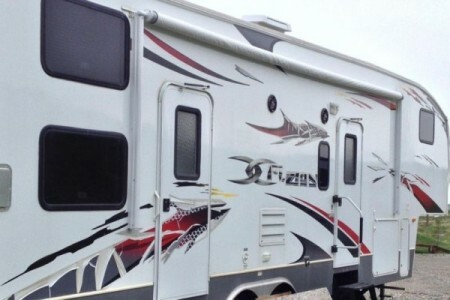 2008 Artic Fox Silver Fox Anniversary Edition 32FT Fifth Wheel. Immaculate Condition! Table w 4 chairs, fireplace, ceiling fan, corian counters, sleeps 4. Huge outside storage and 8500 watt onan generator. Satellite dish. 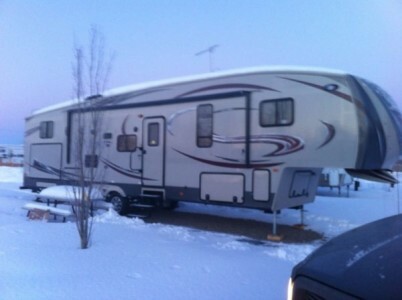 Please call 780-352-1266..
2004 Bison Alumisport horse trailer with living quarters. 12' short wall. Four horse, slant load with mangers and drop down windows. Rear tack with removable post for easy toy hauling. Rubber mats in back. Wood floor front to back. Steel frame with aluminum shell. Beautiful trailer! Selling only to downsize. Full size three way fridge, queen bed on top, dinette in slide folds down for additional sleeping room. Indoor/outdoor sound system. Additional pics available on request. Located in Leader, SK. Please call 306-628-7585. 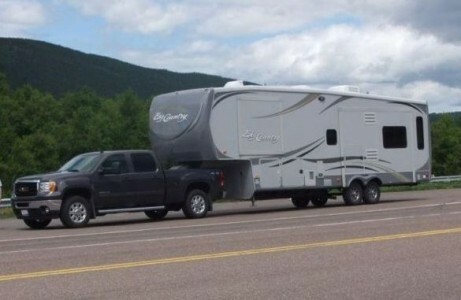 2009 Keystone Fuzion 302 Toy Hauler. 10' Toy Box, double sliding bunks in the toybox with roll out carpet. Onan 5500 generator. 100 gallon fresh water. 90lbs propane. Fuel station. Only 175 hr on the generator. Used 10 times, interior is in perfect shape. Exterior has some decal peeling otherwise maintained extremely well. Original owners. Still has 2yrs warranty. Serious inquiries only. Please call 403-899-7474. 2009 Gulf Stream Prairie Schooner 35fab, serial # 59-0-f35fab-73407. Unit has 5 slide outs, non-smoker, very clean. Please call or texts only @ 403-506-8359. 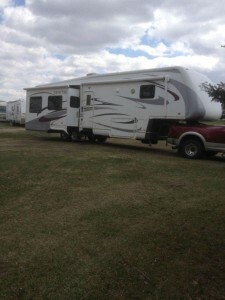 2009 Fleetwood Regal 355 RLQS fifth wheel. Are you working away from home? Why not have the comfort of your own space, Big open design, lots of windows, storage, king size bed, big 2 door fridge, 4 slides, 2 TV, surround sound, full size 1/2 time microwave oven, L shaped island for lots of counter space, fireplace, air conditioning, built in work desk with 2 windows, this unit has the works, even comes with skirting if you want to extend your season. Priced at $37500 for quick sale. Can be viewed in Drumheller. Please call 403-803-8732. 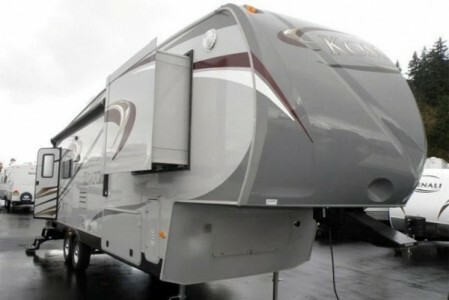 2013 Dutchmen Komfort 30FT Fifth Wheel. 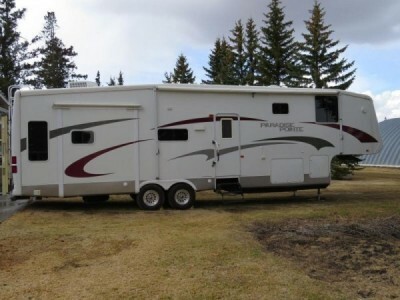 Purchased for 45,000 only 9 months ago, due to recent developments we can not go up to camp this year, the trailer was parked at dickson leisure grounds all summer and winter. 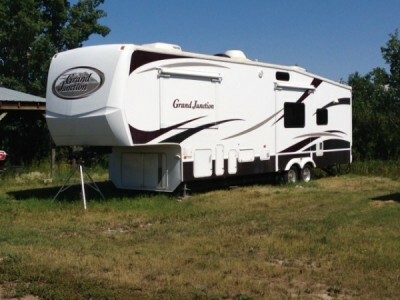 This unit is fully loaded with central vac, ac, 2 flat screen tvs, 2 slides, corian counter tops, 2 leather recliners, leather sleeper sofa, queen bed, power and remote front and rear jacks, power 20 foot awning. This trailer has never been cooked in and only used every second weekend last summer. Please contact @ 403-404-2225 for further info. 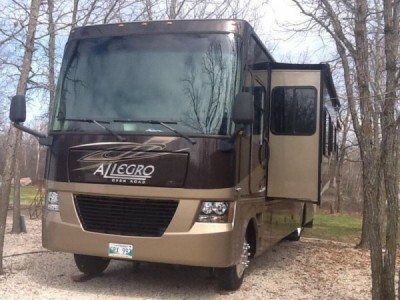 2010 Tiffin Allegro Coach 35ft with 385hp 6 speed Allison trans on a work horse chassis 5500 Cummings gen, Four slides dual air dual furnace double elec step 1/4" thick windows. Black holding tank flush systems water filtration system heated water and holding compartment cable ready tv. Automatic levelling jacks 110 volts exterior receptacle power patio yawning. 50 amp service side view camera and back monitor Compartment doors with gas shocks tinted one piece windshield, Automatic sunshade, BASF full body paint with front cap protective film and three year transferable warranty. Solid wood cabinets. One piece fibreglass roof. Please call 204-756-6773. 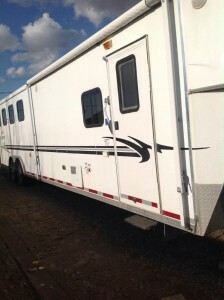 2012 Bullet Premier 35ft trailer for sale, excellent condition, still has warranty need to sell ASAP! Serious inquires only please! Please call 780-518-9032. Full large shower, Fully loaded. Hitch also available. Please call 403-371-7878. 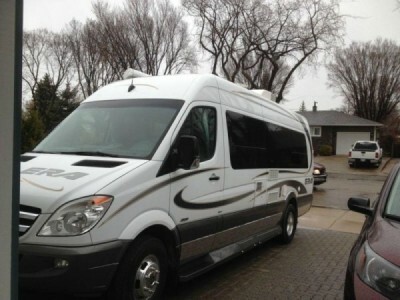 2012 Mercedes Benz Sprinter 70X 24FT Class-B Motorhome. 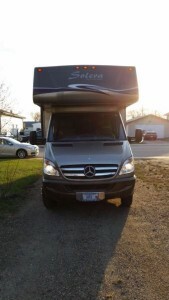 Have a peek at this beautifully maintained, low mileage, 2012 Mercedes Winnebago! 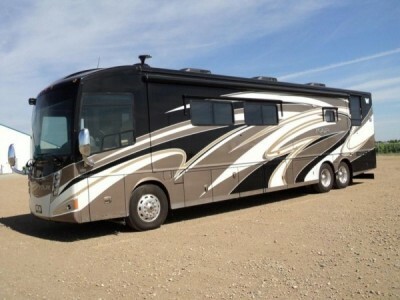 It is a one ton diesel motorhome and is in immaculate condition. 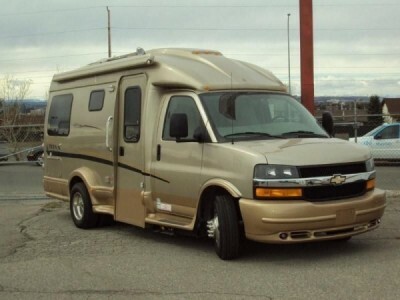 This luxury home on wheels (dually/polished) is a full load with every available option selected. I am retired and bought this as a gift for my wife as I thought we could travel together in it. We went on a few trips with it, and loved how it handled. Drive anywhere, park anywhere! Unfortunately, my wife is not a highway traveler, so we've decided to let it go to someone who can enjoy it's comfort and versatility. It's in excellent condition still, since it was used only one summer. Call/or email me for further details. Will consider partial trades, let me know what you have and we can talk. Please call 204-727-4548. 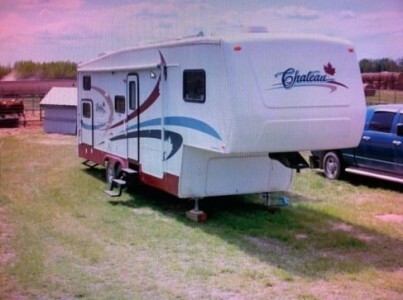 2008 Chateau 32 SL44 5th wheel camper. In excellent condition. Has 2 slides, bunk beds, can sleep 6 (the coach is a hide bed) lots of storage space, solar panels. Insulated and Heated tanks. Great for winter camping. 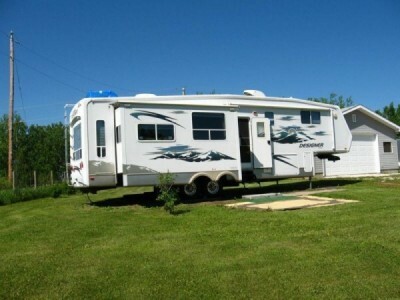 This camper is great for a family or a person that has a camp job or works away from home. It is a must see trailer!! Please call 780-723-1482. 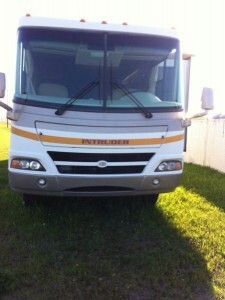 2008 Damon Intruder 38ft Class-A Motorhome. This motorhome is a must see. Very low mileage. New style V10 engine. Gasoline, 3 slides, 2 bedroom, 1 dining room, Portable Bell Tv dome, Very quiet genset, Ample underbody storage. 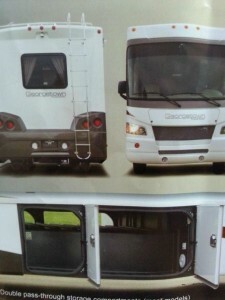 This is just a small list of what this motorhome has in store. Please contact Lloyd @ 780-753-2022 for further info. 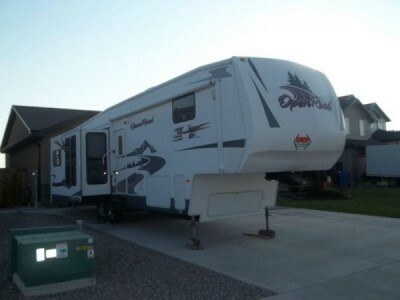 2006 NEWMAR Torrey Pine 5th wheel trailer. One of the best built, four (4) season, 5th wheel trailers on the market. "Moreride" hitch, superstructure aluminum frame, excellent insulation factor throughout. (Can be lived in year round) Fully enclosed under-belly, thermal windows. Three (3) slides, each with awnings. Loaded with electric jacks, front & back. Power awning, washer & dryer (separate units), central vacuum, full size refrigerator, stove, microwave, a/c, furnace. LOTS of cupboard and storage space. Excellent condition. Well maintained, very clean unit, NON-smoking unit. 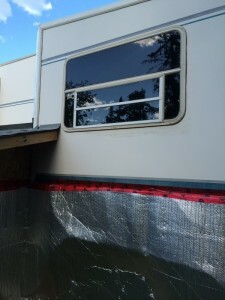 Recently inspected and annual maintenance done by a qualified RV dealer. Please no emails. PHONE CALLS ONLY @ 780-916-4247. 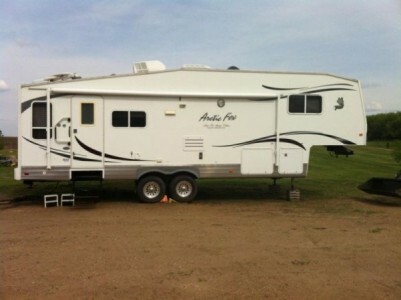 2008 Artic Fox Silver Fox Edition Model 1140 Camper. Dry Bath. Purchased NEW in 2011. 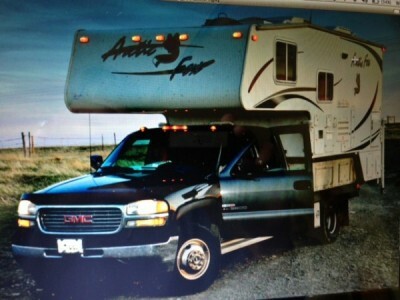 Includes a 2002 GMC 3500 Dually 4X4. 187000K. Duramax LB7, 6 speed standard. Both units are extra clean, and in Excellent Condition. Located in Fernie BC, call for details 250-423-5594. 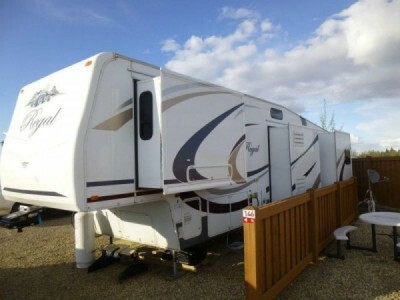 2011 Heartland Big Country 3250TS fifth Wheel, 32.5ft, with a lot of extras. Please contact @ 403-330-4946 for more info. 2009 Holiday Rambler Presidential Suite 5th Wheel, model 37RLQ, A quality pair; 4 slides, separate living room, double fridge, fire place, dual pan windows, bought new in 2010 ($85,000 US MSRP) trailer hitch, 2 RV batteries, 2 TVs, upgraded mattress, front storage shed, new slide seals, new tires. 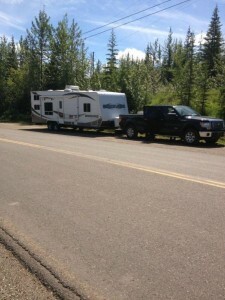 2006 Dodge D3500 Mega Cab 135,000 KM, 5.9L Diesel Engine, many upgrades, lots of chrome. Please call 403-242-6712.